Please telephone or email your requirements. OE equipment on some continental motorcycles and cars. 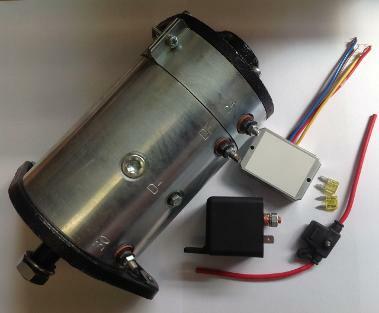 Perfect for adding electric starting to your veteran car, boat or stationary engine. Due to weight, these units are sent out by carrier. Other units available to order e.g. anti-clock rotation and left hand mounting. Please enquire. Our Dynastarter control kit replaces worn or faulty original mechanical devices and uses the existing standard wiring. Fit-it-yourself. Gives a lower cut in speed, better charging and reliable starting **. Fully sealed units so ideal for marine applications where damp/salty air causes problems. Instructions and mounting kit included. Suitable for BOSCH, SIBA, Noris and all other 2 brush Dynastarters or 3 brush Dynastarters properly converted to 2 brush machines. waterproof inline fuse with holder. 16a and 22a versions include a heat sink to aid cool running. HS1 Self adhesive heat sink available for use in hot under bonnet or engine room conditions.